In the biggest piece of unsurprising news in recent memory, Bill Belichick finally pulled the trigger on his boy, Tim Tebow. Tebow comes in to a situation that is best suited for him, as there are zero expectations for him to be a starter at quarterback in New England. In reality, he probably won’t be playing much QB at all while in a Patriots’ uniform. ESPN and all of social networking exploded when the news broke (first from Ed Werder of ESPN) that the Patriot’s would be signing the former Jets’ benchwarmer. With that being said, the writing has been on the wall for this move for some time now. Tebow visited Foxboro as part of his pre-draft tour in 2010 prior to being picked by the Broncos in the first round. The man who had the final decision in picking Tebow in Denver was Josh McDaniels, the then head coach of the team. McDaniels has since re-joined the Patriots as their offensive coordinator. The connections were all there for Tebow to be heading to New England; the question now becomes what to do with him. Tim Tebow is not a good quarterback; however, he is an outstanding football player. You can say whatever you want about his throwing mechanics and how awful they are (they are awful) but the man can flat-out win football games. Bill Belichick likes to have smart, tough players in his locker room who know how to win, and Tebow certainly fills that bill. Can Tebow play a different postion? Can he play a little tight end, maybe a little full back? He has the size and running ability, the question becomes if he is willing to do so. If he wants to have success in the NFL, he is going to have to. Another key attribute that coach Bellichick always looks for in his players is versatility, and an athlete like Tebow might be one of the most versatile players in recent memory. Everywhere Tebow has gone, the circus has seemed to follow him. ESPN has had a fascination with the man ever since he first started having some success in Denver. 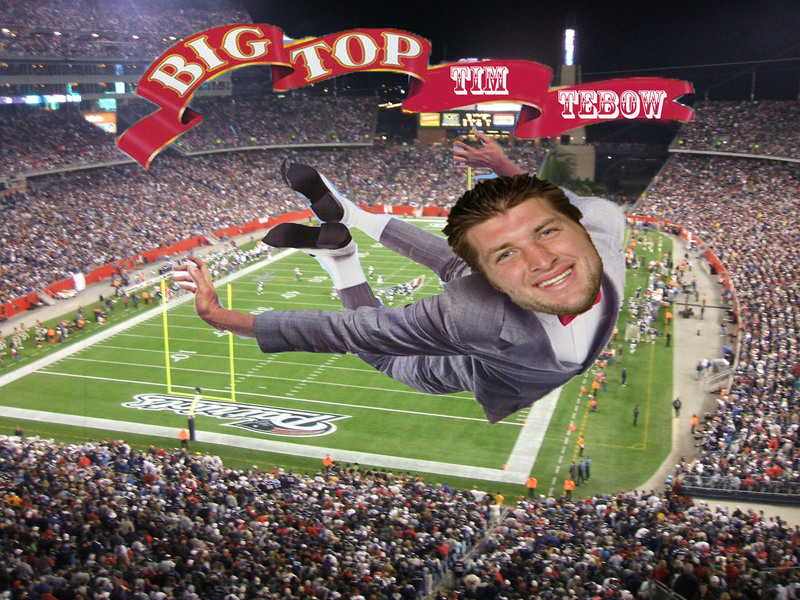 Tebow will be in Foxboro tomorrow for mandatory mini-camp, and you can be sure that the circus will be there as well. Here’s the thing though, it won’t be nearly as big as in the past. The first day Tebow landed in New York, the Jets called a press conference for him, feeding the monster that is the media circus. You can be sure that won’t be happening in New England. You won’t be hearing from Tebow much if at all for the next few months, Tebowmania will not be an issue in Foxboro as it was in New York and Denver. After a round 1 trade the Minnesota Vikings, the Patriots came in to day 2 of the NFL draft with 4 picks, 2 in both the 2nd and 3rd rounds. The team ended up using all of those picks, and in true Patriots fashion, some of those picks came with some question marks. 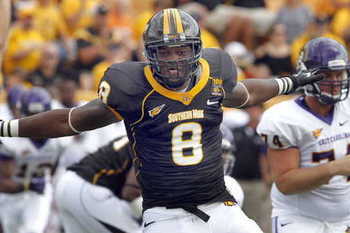 With the 52nd pick, the Patriots selected a player that was probably not on many people’s radars (although Pete Prisco did have the Patriots taking him in the first round) with Jamie Collins from Southern Mississippi. Collins is a 6’4” 240 pound linebacker that projects outside in the Patriots’ defense. Not only did Collins have double-digit sacks in 2012 on a team that did not win any games, he also led his conference (Conference USA) in tackles for loss with 20. According to Jeff Howe of the Boston Globe, there has been a lot of talk that Southern Mississippi tanked it last year after coach Larry Fedora left for UNC. When you consider that, Collins’ numbers are pretty impressive. Collins was actually originally recruited to play defensive back for the Golden Eagles but converted to outside linebacker. That gives a little more credibility to the pick when you consider the Patriots’ need for a coverage linebacker; Collins should be able to cover some receivers with his history as a defensive back. Collins has a long resume of being a great athlete. He actually won a state championship in high school as a quarterback in the state of Mississippi. In the end, Collins just screams a Belichick pick. He’s the kind of player that will be interesting to see how the coach uses him. He is a versatile, smart, hard working defensive player in a position of need for the Patriots. The question then becomes where he was taken. Taking him at #52 could be a dangerous thing, especially if Collins doesn’t work out. There is even more pressure put on Collins as he is the first pick for the Patriots in this year’s class. Next up for the Patriots was pick #59 and it was time for the team to recognize a position of big need, wide receiver. More specifically, a big receiver. Enter Aaron Dobson from Marshall. Dobson didn’t have mind-blowing numbers in his final season for the Thundering Herd when he was hindered by injury, but he does have some of the best hands that I have seen on film. The play that will be talked about the most is the catch against East Carolina. There are a very select few amount of people that can make a one-handed, back-handed grab like Dobson did in that game. While Dobson’s bread and butter is getting deep, taking the top off the defense, going up and fighting for the ball (all of which he does well by the way) it isn’t all he does. He absolutely ran some intermediate routes and screen passes for Marshall. I expect Dobson to start right away for the Patriots, if not for his sheer ability, for the lack of bodies the Patriots currently have at the position. The problem then becomes whether or not Dobson will be able to do what so few other receivers have been able to do in New England, create a good rapport with Tom Brady. Dobson does seem ready to go though. “It’s an exciting time, man. Just to have the opportunity to play in the NFL and play for a great team like the Patriots is just a blessing from the man above. I’m just excited to hit the ground running,” Dobson said in a conference call with reporters. Next, at pick #83 in the 3rd round, came the only player that I had mentioned as a potential target for the Patriots, Logan Ryan of Rutgers. As I mentioned in my latest mock draft, Ryan took over Devin McCourty’s spot when the Patriots drafted him in the first round in 2010. With that, Ryan seems ready to come in to the system and fit right in. Ryan is a good tackler, even in the open field. He, like McCourty is pretty strong in the run game. In the passing game he seems to be able to adjust well and has some fair ball skills. He worked well with his hands in the film that I watched. Before the draft, Ryan had some idea that the Patriots might be the team to call him on day 2. “The Patriots were one of the teams that worked me out and I knew they needed a corner and I felt like I was the guy for them all along. They have great Rutgers connections, but beyond that I felt like I’m a smart, versatile player and I can do well in that organization and I feel like that is a perfect fit,” Ryan said during his conference call. The biggest surprise though came with the Patriots’ last pick of the day at #91. The Patriots’ opted to double dip with the players from Rutgers with safety Duron Harmon. Similarly to the Tavon Wilson pick last year, Harmon was not invited to the NFL combine, so he was not on man people’s radars. In the small amount of film that is available of him, he seems like he is very hard-hitter. Honestly there isn’t much more I can say of him on the field. I can say he was a 2-time all-conference player. This might be one of the most curious picks in the history of the Patriots. While there was some thought last year that Wilson could have been had later, there was also a little bit of talk that he was rising late on draft boards. Harmon was not. No one knew who he was. He could have easily been had after the draft as a free agent. If Harmon was really the best player available on the Patriots’ board, then there is a major problem with the Patriots’ board. “We thought it was good value when we took him. I don’t know what other teams, how they have their boards stacked or anything else. There’s no way to predict that – 31 other teams. I think you have to take the players you feel like can help your team. That’s what we did,” said Bill Belichick about Harmon in a press conference after day 2 of the draft. In the end, this was a solid day for the Patriots. I honestly believe that their first 3 picks could be immediate impact players for the team. But I would have to give them a C overall for day 2, that’s how bad I feel about the Harmon pick. If they picked a player like Barrett Jones or Quinton Patton or maybe someone who was supposed to be drafted, I might have given them an A for day 2. 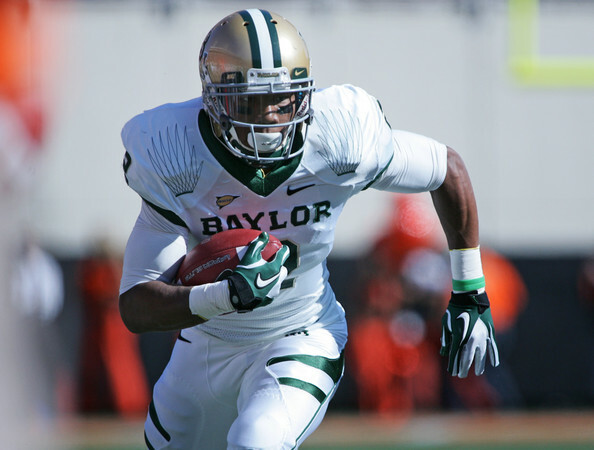 Round 2, Pick 57 – Terrance Williams, WR, Baylor The Patriots are not very deep at wide receiver. Newcomers Danny Amendola and Donald Jones are really their top targets at the position and that should make Patriots’ fans uncomfortable. The Patriots have not been good at picking receivers in the draft (see Chad Jackson) and they have been even worse at developing them after selecting them (see Taylor Price). They need someone to make big plays on offense for Brady, they need someone who will be able to create a rapport with Brady, and I truly believe that Williams is the best man for the job. I absolutely loved this guy on film. He has all the measurables you want in a receiver and he just looks great on the field. He was the deep threat for the Bears for the last couple years and he looks to continue to be that in the NFL. He is physical player who isn’t afraid to go up over the defender and make the tough catch. He runs different routes on the outside too; slants, button hooks, out and in routes make him a versatile weapon that could be dangerous in the Patriots’ offense. He is also a pretty decent red zone threat. I really like Williams, and if he is available at this spot, the Patriots should not hesitate to pounce on him. Round 2, Pick 59– Tyrann Mathieu, DB, LSU The secondary in Foxboro is shaping up to be very interesting for the coming season. They locked up Aqib Talib for at least one more year, Alfonzo Dennard missed out on jail time (at least time that will force him to miss any games or camp), and I absolutely love the signing of Adrian Wilson at safety. Then comes the player formerly known as the honey badger. Mathieu is a bit of small player and needs to be used correctly if he is going to be successful in the NFL. What Mathieu is though, is a big time playmaker; and you can’t have too many of those on your defense. Getting him at this point of the draft also presents some solid value. Mathieu also has a bit of that versatility factor as he is a pretty prolific punt returner, and while that job is pretty much locked up in Foxboro by Julian Edelman, he tends to get hurt too often. 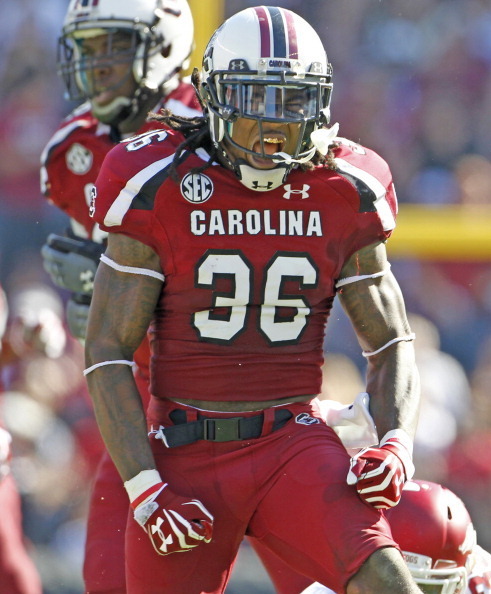 Round 3, Pick 83 – DJ Swearinger, DB, South Carolina Adrian Wilson seems to be the kind of player that may not be suited to play three downs anymore. Swearinger is a well-rounded player that could be a staple of the Patriots’ secondary for years to come. Round 3, Pick 91 – Jeff Baca, G, UCLA I’m sure that Belichick would agree with me when I say that you cannot have too many offensive lineman. Baca projects to play inside at guard but could learn to play center. Round 7, Pick 226 –Joseph Fauria, TE, UCLA Fauria is the nephew of former Patriot Christian Fauria so there is that connection. Tight end is not necessarily a position of need for the Patriots, but with some of the stories of both Rob Gronkowski and Aaron Hernandez in danger of missing a significant portion of training camp, some bodies may be needed. Fauria made some big plays for the Bruins this season and might even have the opportunity to make the team if he really shines in camp. Round 7, pick 235 – Keelan Johnson, DB, ASU Yes, I am a Sun Devil. But safety is still a need position and Johnson is a more than solid player who could be available here. Johnson is a natural leader, and a hard-nosed player on the field. At this point you are throwing darts at the board anyway, and Johnson is a very good player who could make the team or at the very least get a job on the practice squad. When the Patriots selected Ryan Mallett out of Arkansas in the third round of the 2011 draft I, like many others, believed he was the heir apparent to Tom Brady. But as one of my favorite sayings go, conditions on the ground have changed. Brady is still playing at a high level, and keeping Mallett on the bench for much longer is not just bad for Mallett himself, but it is bad for the team. Whether you want to admit it or not, Mallett is not going to be the man to replace Brady when he hangs up the cleats. The longer they keep him on the roster, the harder it will be to actually find someone that can replace one of the greatest to ever play the game. Mallett is currently set to become a free agent in 2015 at the end of his rookie deal, while Brady just signed a deal that would make him a Patriot until the end of the 2017 season. Those numbers don’t match. I simply don’t see Mallett signing another deal to stick with the Pats when he could easily sign with another team with the opportunity to start in the NFL and I don’t see him replacing Brady while Tom is still under contract. Bill Belichick does what is best for his football team, and what is best for the Patriots is to dump Mallett and get something in return while they still can. The team has a mere 5 picks in this years’ draft and nothing in between the 3rd and 7th rounds. A team in need of a QB could give the Patriots possibly a second rounder in next years’ draft and maybe a fourth in this years’. That’s pretty good value for someone taken in the third round. This is also what is best for Mallett. Ryan came on to the Patriots’ team with all sorts of question marks about his maturity. As of this writing he has remained a true professional and the best way to reward that is to give him a true opportunity to follow his true dream, to play starting quarterback in the NFL. The longer he sits on the bench, the less chance he will have of fulfilling that dream, Belichick gave Mallett his first shot in the NFL, now it’s time to give him another. According to reports early this morning, the Patriots were fielding phone calls about the availability of Ryan Mallett. A trade will probably not happen tonight, although it would not shock me, but the Patriots should pull the trigger and dump him. Maybe a team like the Raiders, or the Eagles who really still aren’t set at the position would be willing to give the kid from Arkansas a chance by giving up some picks to New England; and if the deal is right, Belichick shouldn’t hesitate.